OK. It was a dark and stormy night, right? Well, in three months since the end of October, it has only rained twice rather lightly, with only one lightning bolt. 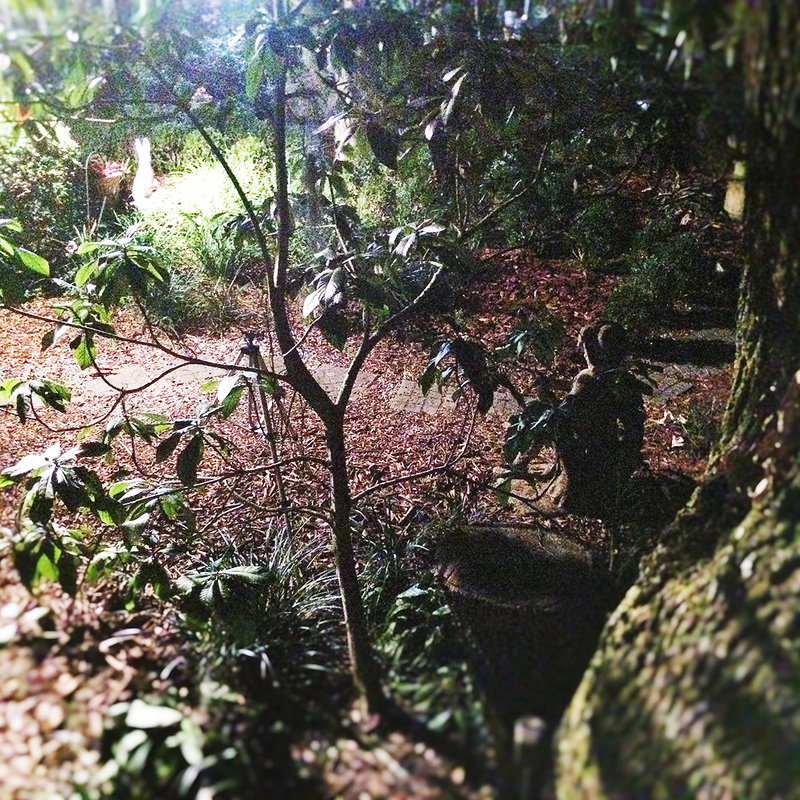 But the LED mini floods that replaced the quartz lights for the garden enhance the surreal atmosphere. I don’t know exactly why, but just as Dame Agatha Christie was drawn to gothic aspects in her writing, I am also so inclined– here in Florida in January. Creaking doors, rattling windows, and heavy fog at midnight really get me going. I’ve always worked with an often whimsical element of the surreal. But then, sometimes, the gothic shadows sneak up on me. Back many years ago, Jill and I, just married, moved into a14 room c.1830 Greek Revival house in upstate New York. We had said goodnight to Jill’s best friend Liz, who was in the guest room we called the “tower room” (because it looked out over the red brick Methodist church next door, beyond which was the tower of the grey stone Episcopal church). I had a strange impulse to go out on the porch roof from our bedroom, and appear at our guest’s window in a white sheet, rattling chains. I almost….almost…carried out the scheme, but squelched it. I live a rather staid life these days, and most of the gothic drama of my past life has disappeared. But occasionally, my romantic predilection flies in like the raven in Edgar Allen Poe’s study. I’ve finally decided to approach it in digital photography. 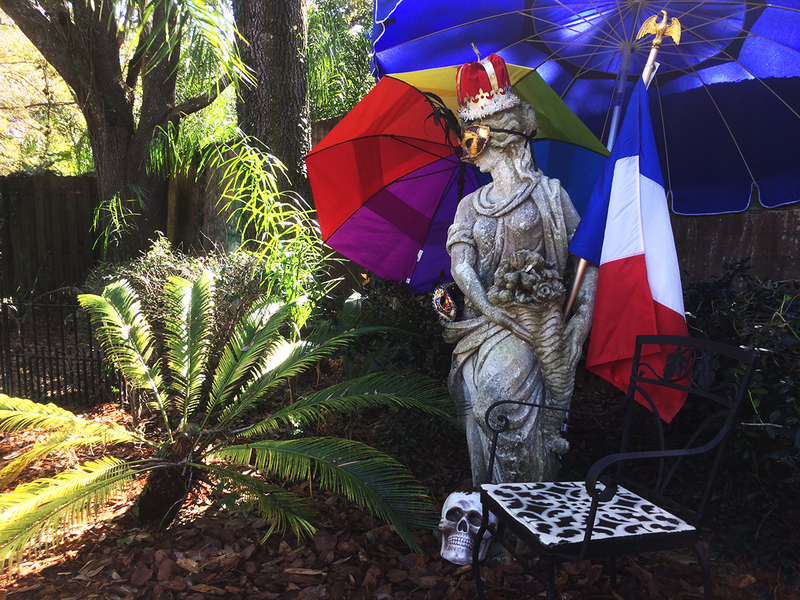 I submit, for your pleasure and contemplation, a few scenes from the garden in Florida and the quixotic museum we live in. There are masks from Africa and Venice, and time-stained column capitals and antique limestone statues from the continent. If all the clocks were working, the hour would be announced with several chime variations. The church organ in the studio is set with my registration that incorporates a “cathedral” effect to make it sound more like the pipe organ I would really like to have. I keep cymbals in one corner just in case I have the urge to hear that sound. Add to that the peacocks’ horrendous screams, and the wind blowing the Spanish moss in frenzied arabesques, and I’m all set. Norma Desmond’s mansion in “Sunset Boulevard” comes to mind. But I’ll let you look at the photos of “sunny Florida” at an artists “haunt” in a very normal suburban neighborhood. It seems to reflect my moods, even this sense of ….mystery!